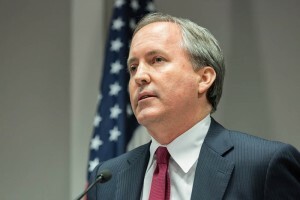 Texas Attorney General Ken Paxton is shown at a news conference in Austin on Jan. 13, 2016, to announce a new unit of the attorney general’s office dedicated to combating human trafficking. Paxton has pleaded not guilty to the three felony counts he faces in the criminal case. Bill Mateja, an attorney for Paxton, said that Paxton’s legal team has not reviewed the SEC’s civil lawsuit. According to the SEC, Paxton persuaded five investors to put $840,000 into Servergy — and did so without attempting to confirm Mapp’s claims about the sales of its data servers and their technological capabilities. A month later, Paxton received 100,000 shares of stock in the company. In marketing materials and investment presentations, the Servergy CEO said he had preorders for the servers from the online retailer Amazon, the semiconductor giant Freescale, and the Canadian software engineering firm Koerr. He also maintained that an independent testing laboratory had found the product needed up to 80 percent less cooling, energy and space compared with other servers on the market. All of those assertions were untrue, according to the SEC filing. Paxton pitched the company to his “friends, business associates, law firm clients” as well as members of his investment group. Among those in the investment group who later bought shares in Servergy was Paxton’s colleague in the Texas House, state Rep. Byron Cook, R-Corsicana. In May 2014, the state securities board fined Paxton for similar conduct. At that time, Paxton, who was then running for attorney general, admitted he solicited clients for an investment firm without disclosing that he would be paid a percentage of the fees the firm collected from their business.